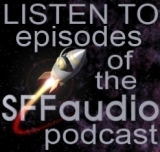 The SFFaudio Podcast #061 – Scott and Jesse talk with Rick Jackson and Julie Davis about City Of Dragons by Kelli Stanley! Wonder Publishing, Brain Plucker, Science Fiction Oral History Association, Forgotten Classics, listening to audiobooks at double speed on the iPhone, Sansa Clip, Tantor Media‘s audiobook version of City Of Dragons by Kelli Stanley, Raymond Chandler, Dashiell Hammett, Catholics should get noir, the Kelli Stanley Wikipedia entry, noir, hard-boiled crime fiction, smoking, 1940, San Fransisco, murder mystery, private detective, Chinatown, Miranda Corbie (the hero of City Of Dragons), Julie’s Happy Catholic blog post about City Of Dragons, modern editing (or the egregious lack thereof), historical fiction, Luke Burrage’s review of A Game Of Thrones, Samuel Shellabarger, Captain From Castile, “Chesterfields really satisfy!”, chick lit, PTSD, page 201, Territory by Emma Bull, They Can Only Hang You Once by Dashiell Hammett, movies vs. novels, page 3, The Stars My Destination by Alfred Bester (our next readalong), using the font and the text on the page to help tell the story, racism, the Yellow Peril, is a female private investigation realistic for 1940?, backstory, the Pinkerton agency, b-girls and escorts, the Spanish Civil War, Donald E. Westlake, Travis McGee, John D. MacDonald, Ross Macdonald, Hostage For A Hood by Lionel White, Gold Medal paperback originals, Noir Masters: An Anthology, iPad, Wonder ebooks on iPad, Death Pulls A Doublecross by Lawrence Block, Blackstone Audio, Jim Thompson, Nothing More Than Murder, Forever After, Midnight Blue by Ross Macdonald, The Imaginary Blonde, you can’t have a noir series, The Killer Inside Me by Jim Thompson, Sam Spade, James M. Cain, Double Indemnity, The Postman Always Rings Twice, Mildred Peirce, Chinatown, worst ending ever, best ending ever, most depressing ending ever, Sunset Boulevard, Mickey Spillane, Perry Mason, Richard S. Prather, Shell Scott, Lew Archer, Harper (1966) starring Paul Newman. Jesse, you’re definitely right about noir being bleaker than hardboiled. The difference is that a hardboiled protagonist is a paladin struggling to redeem a corrupt world — as Raymond Chandler put it, “Down these mean streets a man must go who is not himself mean, who is neither tarnished nor afraid.” A noir protagonist is tarnished and afraid, every bit as corrupt as the world around him. The best he can hope for is to redeem himself, usually through death, though often even that is denied him. There’s a fairly simple test to tell the difference — if the hero discovers that his love interest is a femme fatale who’s been double crossing him, and he responds by arresting her (the Maltese Falcon) or shooting her (I, the Jury), it’s hardboiled. If instead SHE pulls the gun and shoots him (Double Indemnity), it’s noir. That sounds right to me. One problem, with classifying a book as one or the other is that by saying it is “hardboiled” or “noir” you’re hinting at the ending. There is, for instance, a certain Lawrence Block book, available through Hard Case Crime and BBC Audiobooks America, that I figured was just a caper book, until I got smacked down, full bore noir style at the end. Depressingly awesome, or awesomely depressing. I’m in it for Julie’s voice.